PUPILS, parents and teachers took part in a Bollywood dance workshop at Valley Road Primary School in Henley. They were led through three modern Indian routines on the school’s sports field by instructor Kalpesh Zalavaldiya, who had spent the morning teaching children from every year group and introducing to them to the country’s culture, religion and traditions. The youngsters first danced to a piece called Jaiho, which appeared in the soundtrack to the film Slumdog Millionaire, before the adults joined them for a second number called Bollywood Twist. They then performed the first routine together. Mr Zalavaldiya, who runs a school near Wembley called K’z Dance Entertainment and was wearing traditional Indian costume, called out the moves while demonstrating and the rest of the group followed suit. He started with a “namaste” gesture in which the hands are pressed together as a greeting and also had dancers raising their hands above their heads, sliding from side to side and whooping in time to the music. Other moves included “changing the lightbulbs”, in which they twisted both hands back and forth at the wrist, and another in which they spun on the spot as fast as possible. Some children took part wearing coloured face paint or bindis, a red dot in the centre of the forehead, while female staff wore traditional Indian wrap dresses called saris. Others were in fancy dress including formal suits and sportswear as they had also been taking part in American-themed activities earlier in the day. 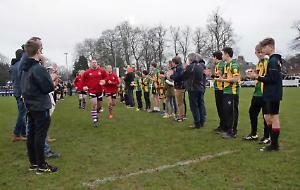 About 100 parents turned up and most took up the offer to join in while others stood on the sidelines taking pictures and videos on their phones. Headteacher Tim Coulson invited Mr Zalavaldiya to come into the school and run the afternoon activity after seeing him deliver a similar workshop to Bishopswood Special School’s nursery, which is based at Valley Road. He hopes to invite him back next year, possibly to celebrate Holi, a spring festival in which participants throw handfuls of coloured powder at one another.